We have been open three years and have had the most nationally accomplished boxers in the history of Fresno! 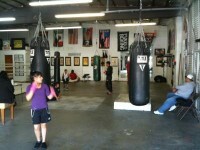 But the best boxing coaching is just part of what we offer. If you interested in getting in shape, this is the place to be! Some members have lost 40 to 50 pounds! We have a 12 year old girl who lost 40 lbs, 15 year old boy who lost over 50lbs & many grown ups who have lost over 40 pounds. With just 3 days a week, you will see results! We have lessons for beginners and skilled. All ages, young and old. We have workouts that are great for weight loss or toning.